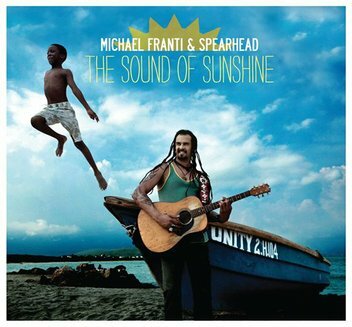 Michael Franti & Spearhead attempt to bottle up the summer for their new album. How does the beach-party-on-CD come across? Hey all and welcome to this week's Jam Central Station. Lots of good music, videos, news, and other stuff for you. Hope you're making the most of the first weekend of fall. Bonfires, hoodies, falling leaves, a chill in the air… A nice change from the 80's that we've had in Toledo this week. Anyways, this week we take a look at a new album that should bring us back to this past summer. Here's a closer look at the new one from Michael Franti & Spearhead. After the meteoric rise of "Say Hey (I Love You)" and his subsequent mainstream popularity, I was obviously very interested in what Michael Franti and his band were going to put together for their next album. At their best, Michael Franti and Spearhead have always been eclectic modern-day poets, writing songs that came directly from their anger about war, poverty, and human rights issues. At their worst they were simply fun, if somewhat idealistic, pop music. Seeing as I enjoy just about everything on the very broad spectrum that Spearhead has done in the past, I was excited about The Sound of Sunshine. That's not to say I didn't have concerns coming in. Spearhead had spent the better part of two decades playing in relative obscurity. They had a loyal fanbase that embraced their diversity and their politics, and they never really had to worry about playing for the public in general. Obviously, that's changed significantly since the release of All Rebel Rockers. I knew that there was the potential for some difficult growing pains on this album, and I knew that there was always the potential that the band would try to make an album consisting of "Say Hey" while avoiding the harsh reality that songs like "Life in the City," "Hey World," or "Yell Fire!" represented. The album opens with the title track, which is also the most recent single. It's a pretty simple acoustic pop song, and I have to think it would be a popular song for the late season beach-goers. It's really a great summer song, but, as such, it doesn't have a lot of substance to it either. Lady Saw makes a guest appearance on "Shake It," and it really feels like Franti used her to take the place of Cherine Anderson who performed with the band on a few tracks from All Rebel Rockers (including "Say Hey"). It's more of a hip-hop song, with Franti espousing his pretty generic love for his lady who he loves "just the way you are." Funny, I remember Billy Joel doing a song with that same concept and then divorcing his first wife shortly after that and marrying a supermodel. That's probably an unfair comparison, and this is a decent hip-hop track, but it's not up to the standard of some of his earlier hip-hop songs. "Hey Hey Hey" is the first song with some depth to it, and it's the type of song that would be just fine either with a backbeat (as it is on the album) or acoustically (which is how I've seen it performed live). Lyrically it opens bemoaning the state of the cities, with kids carrying guns, but it turns more into another lesson in general optimism. Musically, "Anytime You Need Me" sounds almost like a Sesame Street song. Frankly, lyrically, it sounds a lot like a Sesame Street Song as well. It's nice, but again, overly simplistic. Unfortunately, this is becoming a major theme for the album. There's nothing really wrong with the song, but we're now 4 songs into the album, and there's only been one that had something that even resembled depth to it. For a guy like Franti, that's disturbing. "I'll Be Waiting" takes a stab at adding some passion musically, but comes across sounding more like a watered down U2 than Spearhead. Frankly, the title should've been left in "I Got Love For You," a much better Franti song. "The Only Thing Missing Was You" has a pretty clichee reggae backbeat and stays on the same theme of "I love my lady" that the rest of the album has had. There's nothing wrong with a good love song, but so far we're 6 songs into the album and 4 of the songs have dealt with the same topic. "Love Don't Wait" has another bouncy pop-acoustic rhythm, and is another nice little love song. It's also another song under 4 minutes, with no real development beyond the basic "verse/chorus" format. "The Thing That Helps Me Get Through" is one of the better songs of the album, and will probably make a really good high-energy live song. "Gloria" is a pretty good song that starts out reminiscent of "Hey World (Don't Give Up)" from Franti's last album, and stays pretty solid throughout. There's less desperation on the track, and it's one of only a few songs on the album that doesn't sound forced or corny. "Headphones" kills that, however, with very lame lyrics and a repeating chorus of "Plug your headphones straight into my heart." It would be fine as bad 80's music, but it just sounds very dated. The final track is "The Sound of Sunshine Going Down," a slower version of the opening track with some different music. The fact that the album closes with a modified version of the first track is just another example of the lack of depth present on this album. Michael Franti said that much of this album was written during his recovery from appendicitis. Since this was a pretty serious issue for him (it wasn't just your run-of-the-mill appendicitis that most people get) and he legitimately almost died, I expected an album with themes of mortality and vulnerability. Instead, either this experience turned Franti into even more of an idealist and optimist, or it made Franti want to really try and capitalize on the success of "Say Hey." There is some good on the album. Basically, the pop is listenable pop. It's not memorable necessarily, but I'm not a pop fan but I can listen to this pop. Franti is known for being positive and high-energy, and those attributes truly shine through on this album. If this was a summer album, released in April or May, it would be perfectly timed. Unfortunately, since it's coming out at the beginning of fall, it's going to lose the opportunity to be the "Summer album of 2010." The problem with all of the pop on the album is that Franti just isn't that great of a pop artist. He's really a great jack of all trades, master of none. When he limits himself to one style and one theme, the music gets repetitive very quickly. He's great at writing about society and politics, and the different relationship songs that have been interspersed throughout other albums make for a good diversion. They don't have to carry the album. This album needed to be carried by these pop songs, and they're just not strong enough to do that. Knowing what I know about Michael Franti, I don't honestly think he went into this album thinking that he would write a dozen songs that sound like "Say Hey" and become a pop star. I don't think that was his intent. I think he may have seen how many people enjoyed that song and that did end up strongly influencing his songwriting. My hope is that he realizes that pop music isn't his strong suit, and that, after this little interruption, he can go back to providing the social commentary that he does best. Luckily I can always go back to Yell Fire!, which is still powerful and relevant. As for The Sound of Sunshine, I would recommend waiting until you're suffering from Seasonal Affective Disorder in February to put this album on. It's like a beach party on a CD: bright, warm, fun, happy, and not really grounded in real life.